G. von Jagow, T.A. Link, and H. Schagger, Purification Strategies for Membrane Proteins. H. Schagger, Chromatographic Techniques and Basic Operations in Membrane Protein Purification. H. Schagger, Denaturing Electrophoretic Techniques. H. Schagger, Native Gel Electrophresis. H. Schagger, Isolation of Complex III, of Subcomplexes, and of Protein Subunits from Bovine Heart: Triton X-100/Hydroxylapatite. S.K. Buchanan and J.E. Walker, Chromatographic Purification of F1F0-ATPase and Complex I from Bovine Heart Mitochondria: FPLC-Anion Exchange and Dye-Ligand Chromatography. M. Bodicker and H. Weiss, Isolation of Ubiquinol: Cytochrome c Oxidoreductase (Complex III) from Fungal and Plant Mitochondria: Affinity Chromatography. A. Kroger, V. Geisler, and A. Duchene, Isolation of Wolinella succinogenes Hydrogenase: Chromatofocusing. G. Tsiotis, Photosystem I From Cyanobacteria Isolated in Crystallizing Form by Preparative Isoelectric Focusing. Subject Index. A Practical Guide to Membrane Protein Purification is written especially for researchers who have some familarity with separation of water-soluble proteins, but who may not be aware of the pitfalls they face with membrane proteins. This guide presents techniques in a concise form, emphasizing the aspects unique to membrane proteins. The book explains the principles of the methods, permitting researchers and students new to this area to adapt these techniques to their particular needs. 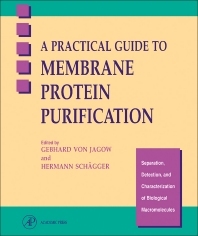 The second volume in the series, this book is an essential manual for investigations of structure and function of native membrane proteins, as well as for purification of these proteins for immunization and protein sequencing. Separation, Detection, and Characterization of Biological Macromolecules is a new series of laboratory guides. Each volume focuses on a topic of central interest to scientists and students in biomedical and biological research. Introductory chapters are followed by clear, step-by-step protocols that present principles and practice. These concise manuals are designed for optimal understanding of methods as well as for practical benchtop use.